If you live in the US or Canada then the iTunes 10.3 beta is ready to rumble on your PC or Mac. Automatic downloads and access to your purchase history is limited to iOS 4.3.3 users on the iPhone 3GS, iPhone 4 (GSM only, sorry Verizon subscribers), iPad and iPad2, and 3rd and 4th generation iPod touch devices. 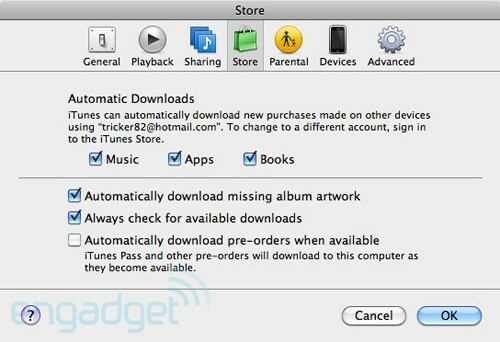 Once you meet those requirements, the iTunes in the Cloud beta promises to keep all of your newly purchased iTunes music in sync between devices while giving you the choice to download previously purchased tracks whenever you want at no additional cost. 10.3 beta also brings the Automatic Downloads feature to your apps and books, now allowing you to purchase tomes from your desktop while keeping them in sync with the iBooks app running on your iOS devices. Naturally, we couldn't help but test it out ourselves from both a Mac and iPhone 4, so click through for our first impressions. To start with, we gave Apple's new cloud offering a go on an iPhone 4 running the latest iOS (production) build, aka 4.3.3. 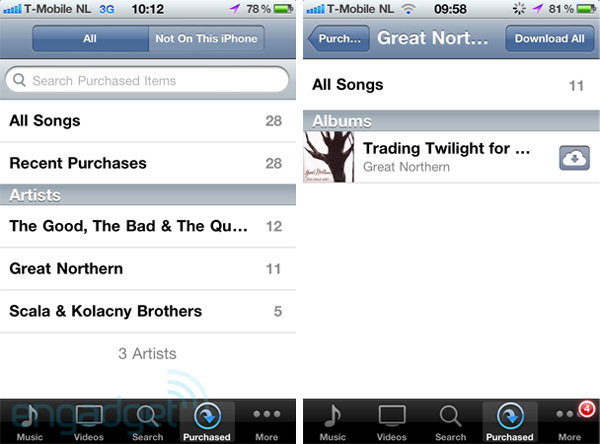 A click on the new "Purchased" icon in the lower tray of the iTunes app gave us a quick look at our purchase history, divided into two panels: "All," and the more useful "Not On This iPhone." A tap on the iCloud icon sent the bits scurrying down to the iPhone over WiFi and even 3G as we wandered beyond the range of our router. Easy. Same experience on the Mac in iTunes 10.3... just as soon as we discovered the modest "Download Previous Purchases" link tucked away in the corner of the iTunes window. A click reveals your purchase history with similar "All" and "Not In My Library" views. 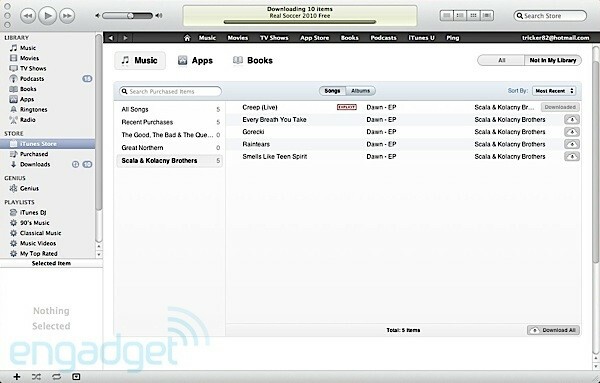 iTunes also provides additional sorting by album, songs, and most recent purchases. 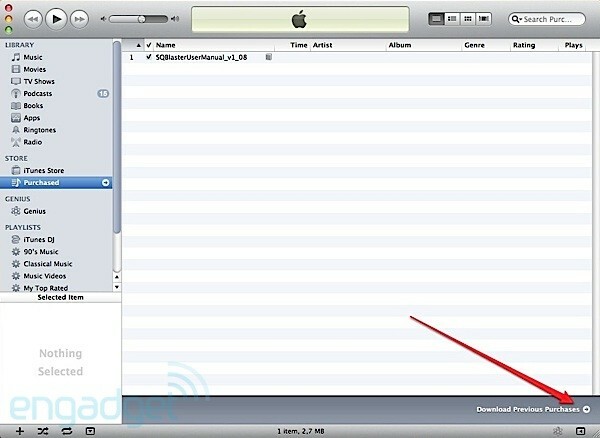 Downloading is initiated with a click on "Download All" or the cloud icon next to each selection. 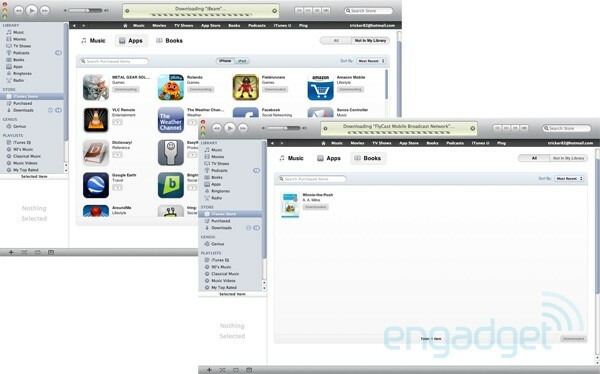 You also have the option to download all your purchased Apps and Books from the appropriate tabs along the top. Of course, you can let iTunes control your downloads by selecting the appropriate content -- Music, Apps, and/or Books -- in the iTunes preferences. By default, these automatic settings are disabled. Generally speaking, the whole ordeal was fairly intuitive as you'd expect from Apple software, even in beta. Unfortunately, the $24.99 per year iTunes Match service that adds music to your iTunes in the Cloud library after scanning your local hard disk drive is not part of the update (it's coming in the fall). Regardless, the 10.3 beta release of iTunes is definitely a welcome update as we look forward to Apple's other unfulfilled "Post PC"-era promises of wireless activation, OTA software updates and a full suite of iCloud services coming with iOS 5 and OS X Lion. We just can't help wondering when Apple will offer a proper subscription music streaming service (a la Rhapsody, Spotify, Rdio, etc.) and leave this individual pay-per-track download nonsense behind. While some might be fine paying $24.99 annually for songs they already own, others would prefer to pay about $10 per month to stream (and locally cache) any and all of those 18 million songs stored in Apple's new North Carolina data center, to any device of their choosing. Baby steps, we suppose. Hit the source link below to try iTunes 10.3 beta for yourselves. While anyone can install it, the Automatic Downloads for iTunes Music appears limited to the US and Canada during the beta.